RollerCoaster Tycoon 2 is a construction and management simulation computer game that simulates amusement park management. Developed by Chris Sawyer Productions and published by Infogrames, the game was released in October 2002 as the sequel to RollerCoaster Tycoon and the second game in the RollerCoaster Tycoon series. Sawyer announced a mobile version under development in 2016. Wouldn't have made and released this port but I couldn't download thedoc's CXEx port, so here it is with Sierra support. PLEASE NOTE: The smears, screenshot size and other things are not the actual game, I just had to crop and compress the images taken with my phone so they'd be small enough to upload. 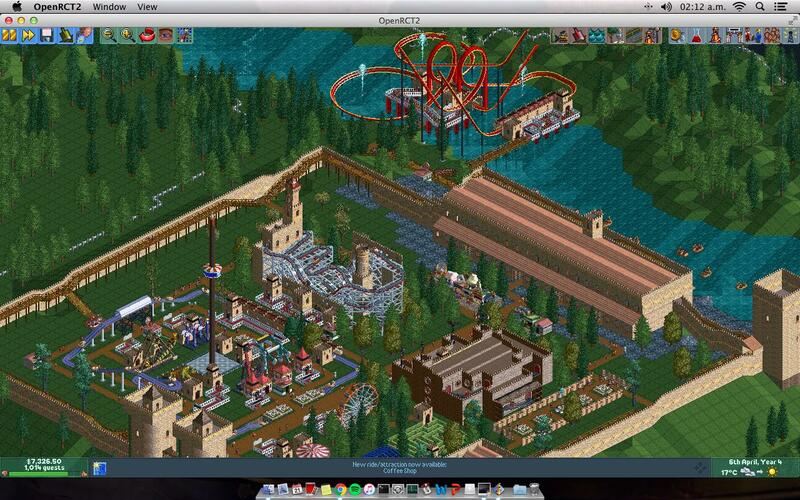 Another alternative to running Roller Coaster Tycoon 2 on Mac (and Linux) is the OpenRCT2 project, which I'm still working out how it runs the game (you simply need to supply the install location of the PC game on your Mac, then it launches it), but it does-adding more features and better things than the standard game has, such as online multiplayer, full widescreen support, resizable native windows and taking screenshots, as well as hundreds of others. Unfortunately you still need to install the game, so I recommend using this wrapper, Installer or Kronenberg's Wine.app to install the game. You can download OpenRCT2 here. I recommend downloading the wrapper using Chrome or Firefox because Mega can crash Safari. 1. Install the game from your .iso, CD or copy the install files off the CD and run setup.exe in Wineskin. 2. Go through the installation and DO NOT REGISTER your product-when that windows opens, click 'No' then 'Don't Register'. Just a friendly reminder to everyone, there is a tutorial on OpenRCT2's website on how use the game fully unlocked using the demo version of it, also I recommend you all using the launcher since it autoupdate the app, it really works great. Yes I agree, OpenRCT2 is a much better way to run the game-I frequently use it to play with friends.